In a competitive world, you want the best technology tools in the classroom; technology that will offer superior advantages for your teachers and students. DLP projector technology has been offering this advantage for years and continues to raise the bar through innovations that expand instructional reach for teachers and lower the total cost of ownership (TCO) for schools at the same time. With Filter-free designs that require less maintenance and offer lower operating costs, DLP projectors help your school save money. 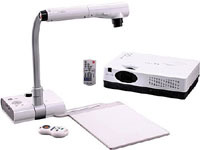 Plus, unlike other technologies, DLP projectors are virtually immune to color decay (a yellowing of the image after extended periods of usage), so you will have a reliable system even after years and years of use.Today's technologically savvy students need to be engaged in a dynamic and immersive way. DLP projectors deliver interactivity and multi-dimensional curriculum to the classroom with unparalled image quality. The result: higher student involvement and higher test scores. Imagine the possibilities of a classroom designed around a DLP projector system. The most complex lessons can be brought to life though integration of virtually every teaching tool under the sun with the projector system. A DLP education projector can help improve student performance by encouraging greater classroom participation to increase the retention of the content being displayed. From video game style role-playing and interactive simulations and digital imaging-based presentations, to engaging Internet excursions, students get so much more from the curriculum when it's experienced through the brilliance and clarity of a DLP projector.